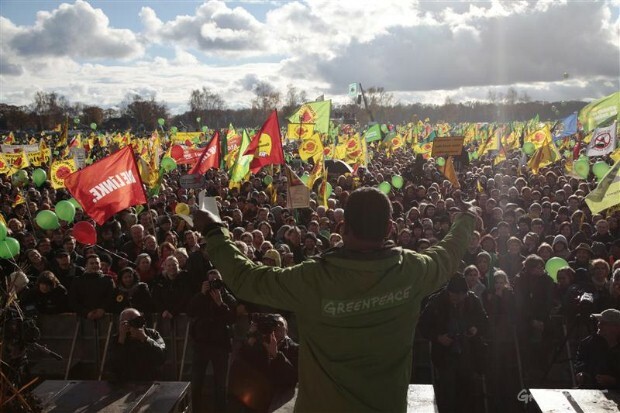 Kumi Naidoo addresses the rally attended by 50,000 people in Dannenberg, Germany against CASTOR nuclear transport. Image: Gorden Welters, Greenpeace. Right now in Germany we are witnessing an unprecedented mass mobilization against radioactive waste and against the operational extension of 17 nuclear reactors in the country by an average of 12 years. This anti-CASTOR (Cask for Storage and Transport of Radioactive material) mobilization is the largest Germany has seen, and includes both the young and the old, farmers and politicians, environmental and youth groups. It is truly a grassroots movement, united behind one goal: saying 'Nein Danke' -- 'No thank you' -- to nuclear energy. I had the honour of addressing this movement at a rally yesterday where I was particularly moved by the inter-generational nature of the crowd. Whole families turned out in solidarity with local residents who have been protesting against radioactive nuclear waste for the past thirty years. This year the demonstrations have escalated because of the decision taken by Chancellor Merkel, and her government, to cancel the legally set deadline for the phase out of nuclear power in Germany. In my address at the rally yesterday I called on her to end nuclear madness and to ensure that Germany is remembered for its leadership in a real energy revolution rather than remembered for backsliding into an outdated obsolete atomic age. Germany does not need nuclear energy and is a global leader in renewable energy - currently employing 380,000 people. The CASTOR nuclear waste transport is an example of the nuclear madness that must end. It is a train convoy carrying eleven 100-tonne containers of radioactive waste that is reprocessed in France and returns to Germany each year for storage. Measurements of these eleven containers done by ANDRA (National Agency for Radioactive Waste Management) show that the radioactivity in each container is higher than what was released at Chernobyl in 1986 -- this makes the CASTOR transport effectively a Chernobyl on wheels. The final destination for this dangerous convoy is Gorleben, Germany -- where it is to be placed in a storage facility that is completely geologically unsuitable. Of course, there is no suitable storage site for nuclear waste -- the nuclear industry has no permanent solution for the problem of radioactive waste. This is what the people of Gorleben have mobilized against each year -- and this year they are joined by more people than ever before. Local farmers have opened their homes to house the demonstrators who have come from across the country and beyond. The people's resistance in Gorleben sends a valuable and universal message: We will not bow to the government acting in the interest of the nuclear industry rather than its citizens. All other governments considering nuclear energy should take heed.